We have been informed of the death in Toronto, aged 67, of Jacques Israelievitch, one of the most influential Canadian violinists of his time, or any other. Jacques was 23 when Georg Solti named him assistant concertmaster in Chicago in 1972, the youngest player in the orchestra. He went on to serve seven years as concertmaster in St Louis and 20 at the Toronto Symphony, longer than any other occupant of that seat. 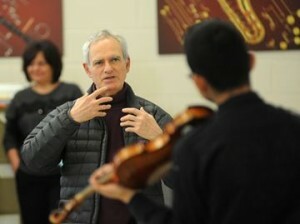 In 2008, he became music director at the Koffler Centre for the Arts. Born in Cannes, France, Jacques studied at Indiana University School of Music with Josef Gingold and Janos Starker, and chamber music with Menahem Pressler. In Paris, he took lessons with Szeryng and Milstein. He received the French Légion d’honneur and the Order of Canada. He died of cancer complications and will be buried on Monday. Jacques is survived by his wife, Gabrielle; three sons, David (of Seattle), Michael (of San Francisco) and Joshua (of Northern California); and two grandchildren. He was delighted to know that his son Michael had just been named acting principal timpanist of the San Francisco Symphony. Very sad news. He was a fine musician. Some years back he played Mozart D Major concerto with me. It was elegant, sensitive and imaginative playing. Rest in peace Jacques Israelievitch. Wow, I didn’t realize he was that young; I first heard of him years ago. How sad to die so young, even though he clearly had a full if not sufficiently long life. But why “Solti’s Youngest Player” in the headline? Is that really the most catchy thing one can say about the man? And it’s not correct: John Bruce Yeh joined the CSO clarinet section in 1977 at age 19 or 20. Very sad indeed and much too soon. He was a fine high quality musician and a truly good person – a real mensch – which I had a pleasure of experiencing personally. He helped me generously and wisely when I really needed some professional advice. A friend told me that his last recital was just three months ago performing three Mozart Sonatas in Chautauqua. Jacques (and Christina Petrowska-Quilico) played 4 Mozart sonatas in his last concert on July 11th, less than two months ago. It was indeed in July – barely eight weeks before his death! Was he still in his usual fine violinistic shape? In any case, it is very impressive. But unfortunately just as sad. He inspired so many and helped my friends along the road to reaching their potential! This is shocking and terrible news. Jacques was my teacher from ’79-’82 when I was in high school struggling with my instrument, and then again in college at music conservatory in St. Louis from 83-84. He was the kindest, most insightful, and incisive intellect and artist I have ever known. I remember conversations I had with him in those lessons like they were yesterday, and I owe to him the greater part of my education. It is with great sadness that we have lost him so soon, and that I will never see him again.